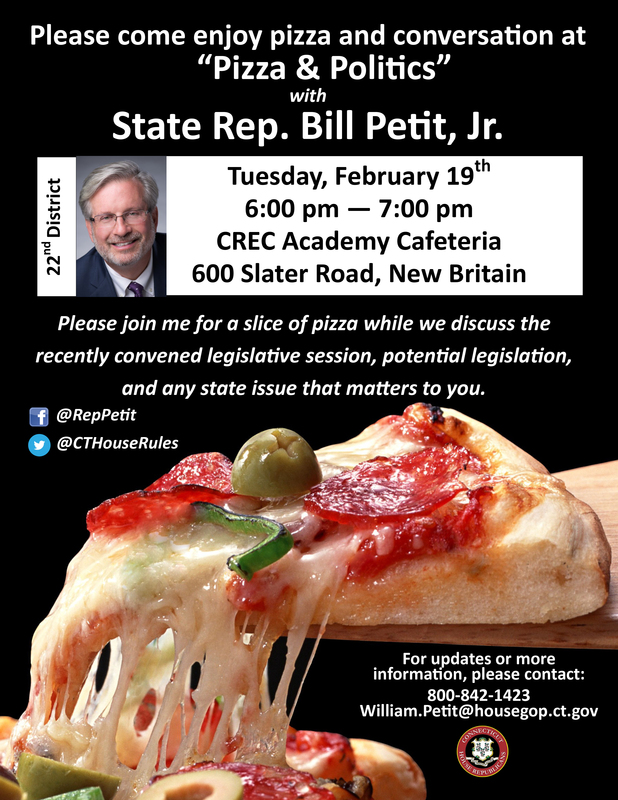 HARTFORD – State Representative William A. Petit Jr. (R-22) will be hosting a Pizza and Politics event for both New Britain and Plainville residents on Tuesday, February 19th to discuss the start of the 2019 legislative session. WHEN: Tuesday, February 19th from 6:00 p.m. to 7:00 p.m. These events are designed to provide residents with an opportunity to speak with the representative in a relaxed setting about issues affecting the district, bill proposal ideas, or other legislative related topics. The event is free and open to residents only and pizza will be provided. If you have any questions or cannot make the event but would like to connect with Rep. Petit, please call (800) 842-1423 or email William.Petit@housegop.ct.gov for more information.